There's so much dentistry can do these days to make your mouth healthier and your smile more beautiful. Yet many people don't take advantage of this because of a long-standing fear of dental treatment. If you are one of these people, rest assured that it's possible to have an experience that's free of anxiety and pain. This can be accomplished by blocking your sensations of pain with local anesthetics or by giving you medication that can help you relax. Sometimes both are needed to ensure maximum comfort, especially if you are someone for whom the injections that deliver local anesthetics are themselves a major source of anxiety. When you are afraid of dental treatment, your guard goes up and your pain threshold goes down; anticipating that something will hurt makes you hypersensitive to every sensation — even sound. If this describes your experience in the dental chair, then you might benefit from sedatives that can be given during your visit to make that anxiety melt away. Before any particular sedative is recommended, you will be asked to provide your complete health history, including any medications you are currently taking — both prescription and over-the-counter. It is also important to know if you smoke or drink. On the day of your treatment, you may need to have someone drive you to and from your appointment as certain medications take time to wear off. IV Conscious Sedation — Sedatives delivered directly into the bloodstream intravenously (into the vein) are more potent than when taken orally, and the amnesic effects may be more profound. 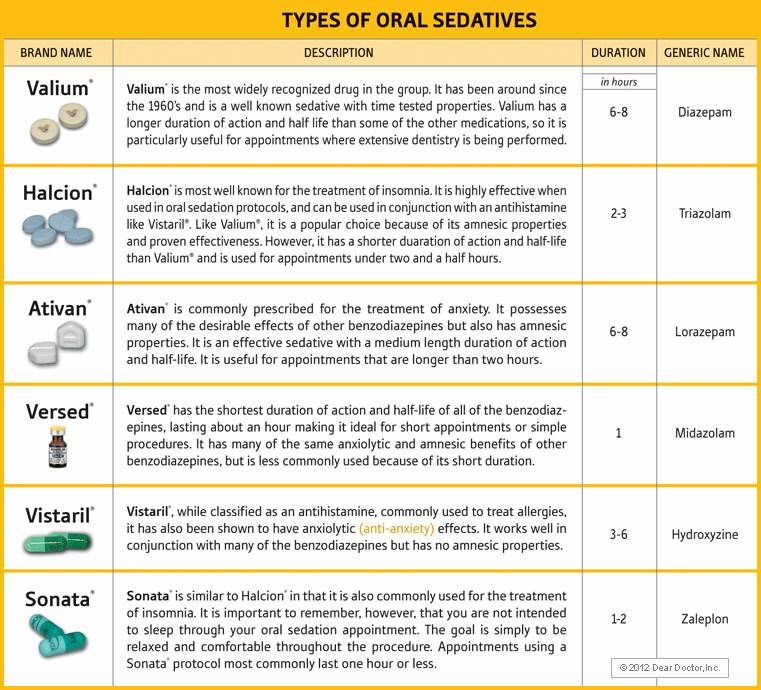 Because IV sedation has an almost immediate effect on the body and its functions — including heart rate, blood pressure and breathing — there is a higher degree of risk associated with it than with other types of sedatives. There is also a higher level of training required for those who administer it. As with all sedation (except nitrous oxide), you must be monitored with specialized equipment throughout your IV sedation treatment. The main advantage is that drugs administered this way work immediately and the level of sedation can be adjusted more quickly and easily. And with most sedatives, you won't remember a thing about your dental procedure after the sedative wears off.